So we see that you’ve bought your above ground pool, haven’t you? Well, it is only logical now to get a staircase or a ladder for your pool. Because as much fun as jumping or climbing your way into the pool is, it isn’t very practical in the long run, is it? Often it can seem ungainly, and quickly turn hideously fatal. Don’t be alarmed though, we are not trying to scare you. What are we doing instead, is that we are stressing the importance of safety. And for exactly those stringent safety standards that one must personally adhere to, above ground pool ladders and staircases were created. As always, we have rigorously tested and researched a large number of options for you to consider. It took us a while, but it was definitely worth the toil. Here are the final six that you must consider. One of the bigger ladder models, this pool’s steps measure at about 18 inches by 5 inches. The maximum load supported is no more than 300 lbs. We’re delighted to report that the ladder comes with a lockable Roll Guard Barrier safety mechanism. It’s function is to lock the steps when not in use. In our findings, this model was really light in weight and yet solid in operation. We do recommend that you put some friction mats under the pool support as there is no friction coating provided to do the same job. Staircase style from Confer is our favorite in terms of design and looks. This ladder sports the largest steps from the lot. They measure at 31 inches by 47 inches and are approximately 32 inches deep. We are glad to report that the maximum load that this ladder can carry is around 400 lbs, biggest by far among all the models we tested. But, it’s not all sunshine here. One thing we didn’t appreciate was the fact that you have to insert some weight into the steps to keep it from floating. To it’s credit though, the pool material is such, that it can withstand strong UV rays and hence the resin polymers provide a long life. Again, the maximum depth supported is 56 inches like many on the list. Do keep in mind that side supports are hollow, so you may need to put in some sand or gravel to keep the ladder down. 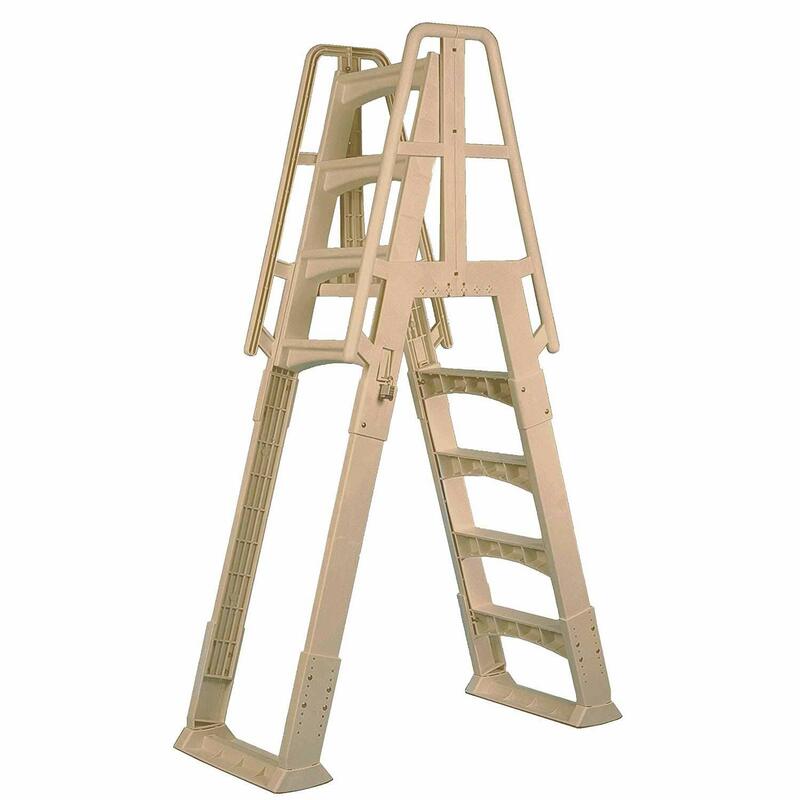 Manufactured by Confer Plastics, and weighing around 28 lbs this ladder is very easy to maneuver. 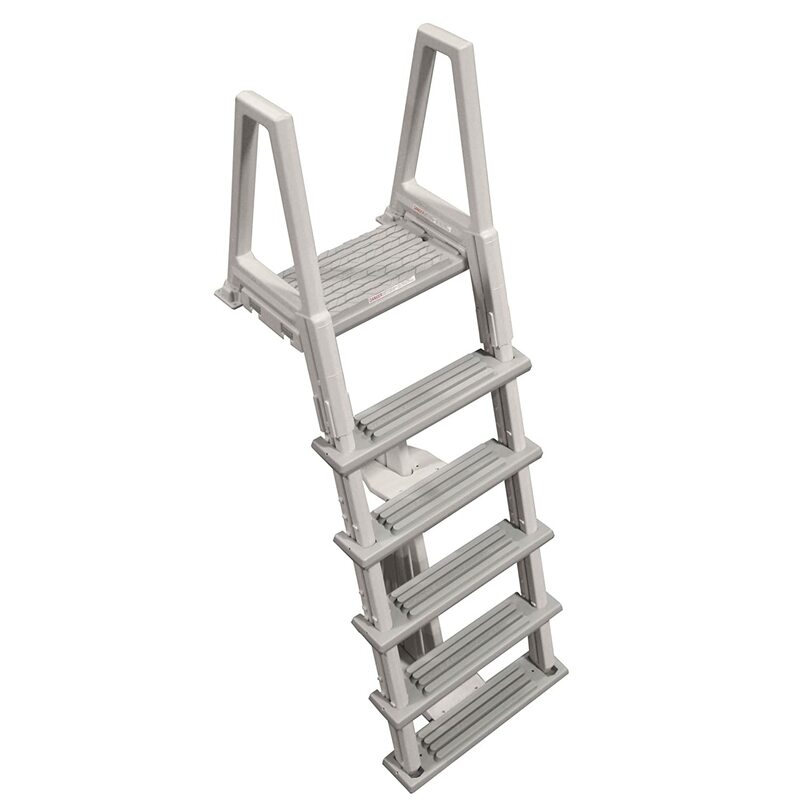 Unlike some other swimming pool ladders, where you are required to put some sand or a rough surface at the bottom, this ladder has a friction coating at the bottom. No more nervous climbs in and out of the pool! And as for the dimensions, it measures 5 inches by 18 inches in steps area, and 22 inches high handrails. The weight that this ladder can support is a maximum of 300 lbs. In our tests, we found that it is compatible with pools within a depth of 56 inches. This one is a really practical design from the manufacturer Vinyl Works. 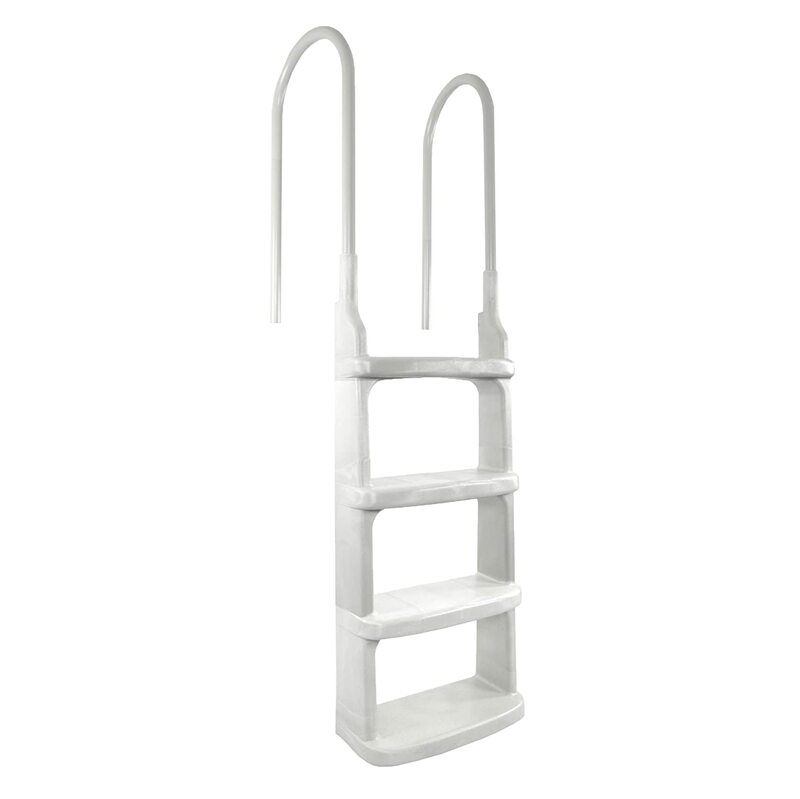 It may not look like your typical ladder for the pool, but it’s bulky design ensures rigidity and eliminates racking. 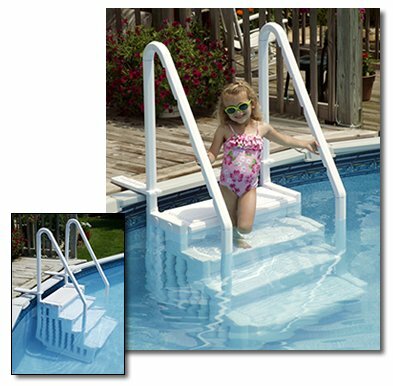 Easily suited for pools with depths in the range of 48-56 inches, it comes with double handrails to keep a tight grip while entering and exiting. As for the weight supported, the average Joe or Jane shouldn’t have any problem as the maximum load carrying capacity is 300 lbs. And finally, it has a slide lock design so that no one swims through, across or behind it, when the ladder is in the pool. Mega Pool and Spa manufactured this ladder set. The dimension of this ladder is around 81 inches in height, 32 inches in depth and 32.5 inches in width. It’s one of our favorite ladders. Why? Simply because the steps have been perforated to allow the flow of water. This ensures that no water stands stagnant and no algae forms over the steps. Neat, right? As for the depth, any pool with a maximum depth of 54 inches should be able to fit this ladder. We had no problems whatsoever. Another useful feature includes, an easy to install ballast weight to ensure winter storage is headache free. 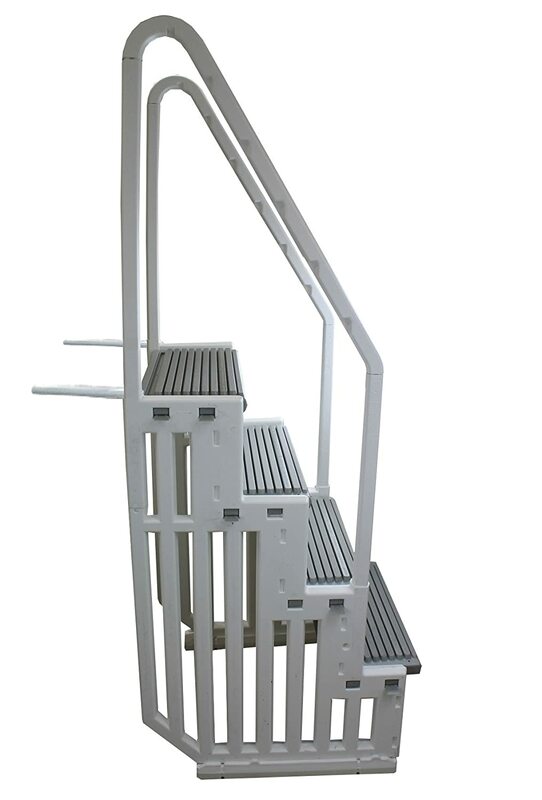 Manufactured by Main Access, this pool ladder can work with any above ground pool deck. It is well suited for pools as deep as 52 inches. The bottom step has a depth of around 9.5 inches and the top step is around 6.5 inches deep. As you go below from the top step, the difference in height gradually decreases. We were delighted to find that all the necessary hardware for mounting purposes was already provided. We needed nothing extra to set our pool. And don’t be worried about the build quality of the pool. It can support 320 lbs of weight easily. More often than not, most built in pool ladders are of poor finish and quality. This necessitates buying a decent pool ladder that is not only rust proof and slip resistant, but also sturdy in design. A good pool ladder must come with grippy hand rails and steps. Safety of the people should be given utmost priority by providing non-slip parts. Good products need good raw materials. And your pool ladder is no exception. 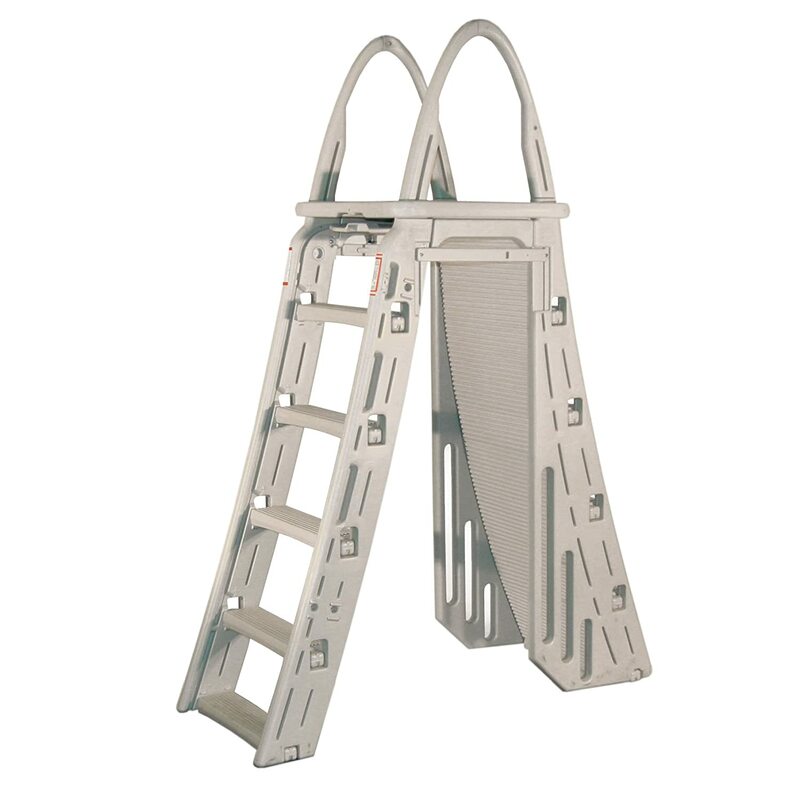 Building the ladder from high quality plastics or metal ensures good built. This one is a no-brainer, isn’t it? Your ladder must fit into your pool. So choosing accordingly can save you from unnecessary hassles. We recommend that you consider your budget while buying. Select a pool ladder that provides maximum features for a reasonable price and doesn’t compromise on safety. A pool ladder serves one, and only one purpose; safety of the pool inhabitants during operation. While buying, lookout for anti-slip features in the handrails and steps of the pool. It would be safer for the elderly and the young alike. You must also give extra thought to some locking mechanisms. A well locked pool ladder won’t budge while in use, and hence enhance the safety of it’s users. Lastly, select a pool with some friction coating or friction materials present at the bottom for better grip. Here we will highlight the three common ways to get in and out of the pool. The most common type of pool entry system is a step entry system. It is very simple to manufacture and design, and is thus found in most pools. They usually are made of plastics or resins. Also cheap, but comes with more number of options. They are made from plastics, resins, stainless steel and even aluminum. This type provides a really easy way to get in and out. Not very common, neither rare, they provide a solution for people looking for hybrid setup. Although, do note that you should place the ladder part on the inside and the steps on the outside. Generally, it is considered a wise decision to choose pool steps over ladders. We’ll tell you why. It is because of the fact that steps are more stable and have wider tread. Children and elderly will not have a hard time getting in and out if you choose steps to install. They are also a more permanent option if you’re looking for one. On the other hand, a ladder may be cost effective, efficient and versatile, but because they are vertical, they are not suitable for grandpa and grandma. Your swimming pool will work with and without a ladder. But, installing one can increase the safety of everyone and prevent any mishap. So, pick a great ladder according to your needs from our list above, and complete your pool experience to enjoy with your family.